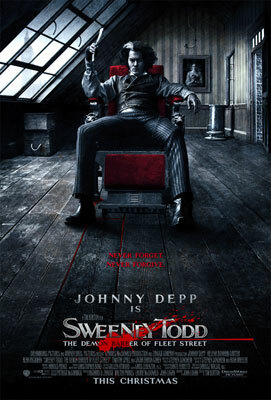 Sweeney Todd Is [Pardon The Expression] Bloody Good Fun! No one thought that making a movie adaptation os Sweeney Todd was a good idea, though they certainly tried for a long time. Finally, the legendary Sondheim play came [or fell] into the hands of the one director who could take its stylishly macabre tale and do it justice. With playwright Stephen Sondheim performing surgery to cut the three hour play to two hours for the film [and having casting approval] the big question was whether the dynamic team of Tim Burton, Johnny Depp and Helena Bonham Carter could make movie magic with the property. In short, they could and have and we are the beneficiaries of their twisted labors!